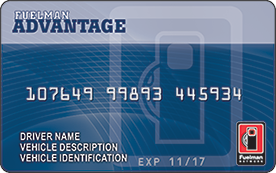 The Fuelman Advantage Fleet Card is the choice for businesses with larger fleets that want controls and volume-tiered savings. Fleet managers can earn 5¢ per gallon through volume-tiered discounts and save money with customizable card limits that help prevent unauthorized purchases. Enjoy acceptance at 50,000 stations and 20,000 maintenance locations nationwide. Set purchase controls and be informed of driver transactions to prevent unauthorized spending. Drive your fleet knowing expenses are more controlled and less incidental with limits on fuel type, time, date, and gallons. Be aware of your drivers’ spending habits and activity with real-time text and email alerts on unusual transactions. The world is moving digital, so why shouldn’t your fleet? Besides fueling and maintenance, fleet managers can enroll in automated tax reporting for off-road diesel and IFTA filing purposes, while identifying convenient service locations all online. *Volume Tier rebate schedule based on monthly billing cycle and capped at 14,000 monthly gallons; schedule pro-rated for weekly and bi-weekly billing cycles. Actual savings vary based on the number of unleaded and diesel grade gallons purchased during applicable billing cycle. Rebate is not available on purchases at The Convenience Network brands including Loves, Chevron/Texaco, Arco, Sinclair and Walmart/Sam's Club. Transactions at Arco are subject to special pricing. Rebates are subject to forfeiture if the account is not in good standing. Program pricing is re-evaluated annually and subject to change thereafter. Program Terms and Conditions apply. Visit www.fuelman.com/terms/ for details. Fees may apply in some cases, such as for optional services, late payments and/or credit risk.Fuelman® is a registered trademark of FLEETCOR Technologies Operating Company, LLC.